A healthy and nutritious snack, and a condiment. 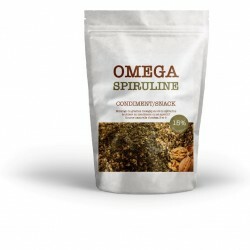 Omega Spirulina is naturally rich in calcium, magnesium, vitamins, essential fatty acids as well as Omega 3 and 6. Made from toasted seeds, Omega Spirulina is naturally rich in calcium, magnesium, vitamins, essential fatty acids as well as Omega 3 and 6. With 15% of Spirulina is a mixture rich in proteins. Very nourishing, it is an ideal snack that also plays the role of "appetite suppressant". Usage tips : Serve at will ! If hungry throughout the day. Sprinkled in your cooking, a salad or a plate already served.